No, it’s not a big budget re-make of Night of the Lepus. You wish. 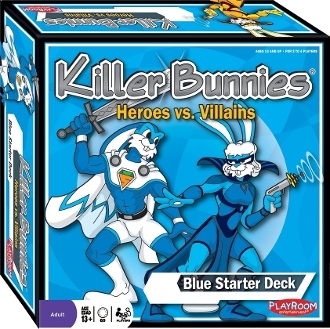 No, in 2013 the well-known card game Killer Bunnies (created by Jeff Bellinger and published by Playroom Entertainment) marked its 10th anniversary. In celebration, Playroom have recently released a new game, Killer Bunnies: Heroes vs. Villains. Here’s there description: “Drawing and playing cards from a shared deck, players may choose to be a defender of goodness, courageousness and virtue by playing the Hero Super Bunnies or a generator of chaos, evilness and deceit by playing the Villain Super Bunnies. Whoever they are, the players use their bunnies’ powers to build cities, attack opponents, and protect themselves. The first player who has a predetermined number of bunnies in the Bunny Circle and cities in the City Circle wins!” Playroom’s Killer Bunnies web site has more, including sample artwork from the game.